Here is an article by Samantha Miles about some of the symbolism and meanings of the Wheel of Fortune tarot card. Have you noticed that some aspects of your everyday life are suddenly moving quickly or in a way that seems led by the forces of the universe or destiny? Do you consider yourself to be at a really important crossroads in a relationship or in life? Do you find yourself stopping for a second to remind yourself that every decision you make could cause an inevitable big change in your life? Have you been able to predict how things have turned out? 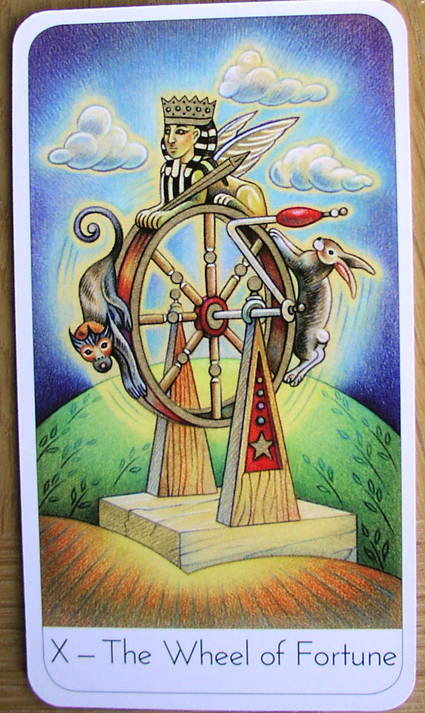 If you choose to get an online tarot card reading or do a reading for yourself during a time in your life when the world seems to be going in your favour, the Wheel of Fortune could appear as one of the cards. Do not fret, because this card heralds and represents the very forces of change that will play an important role in your life. 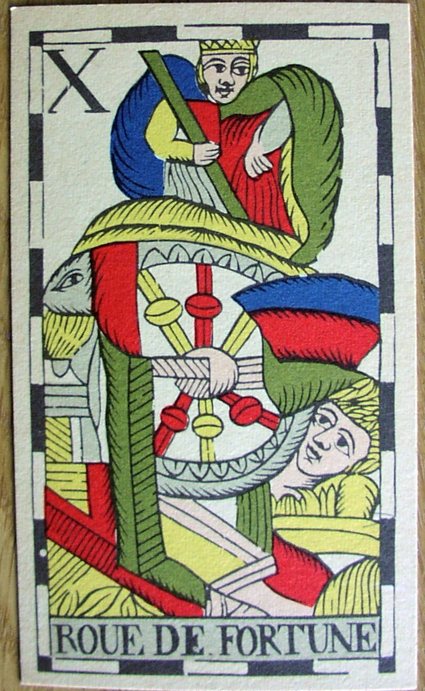 Here are some of the symbolism and meanings of the card Wheel of Fortune. This will prove useful if this card appears in one of your readings in the future. The appearance of the card Wheel of Fortune in your reading means something is about to change, or is changing at the present time. This generally means a positive change for most people. But, for some people, this could represent a problem if they are unable to cope with change. Some of these issues can come about due to traumas that happened during childhood. But you have to always remember that change is a natural phenomenon and is inevitable in every sense of the word. You are always bound to change—the environment, the people you are close with, the weather, your financial stability, your happiness and sadness, your overall state of mind—they will eventually change, either for the better or the worse. talk to this person to renegotiate some terms in order for the relationship to work for both of you. is how you can solve things in life—proper communication. If, on the other hand, you are single, you need to have a mental image of what you really want from romance. Do not settle for anything less. You can start going out with your friends and you will eventually find someone who is exactly like what you imagine he or she would be. This card will serve as a gentle reminder that no bad things last for a lifetime, everything will eventually come to and end. Whether if you are having a bad time or a good time, everything passes. If today you feel you are having the best time of your life, align your perspective and get back to reality, which is that everything will change. This way, you can no longer disappoint yourself because you have successfully managed your expectations. Enjoy what life has to offer in the present while counting your blessing. And, before you go to sleep, allow yourself to realise that some things are just beyond your control. Roll with the punches and don't let go of your positivity in life. There is a possibility that you are thinking of quitting your current job, even after reminding yourself that you are lucky to have landed the work. You might choose to leave because your heart is no longer in whatever you do. You could hear a voice that calls to you, saying that you need to follow what you really love, no matter how hard it could be nor how much it seems impossible now. It is your time to be brave, especially if you wish to do something that you have zero knowledge of. You could start reading up about it online or call a friend who knows about that type of work. Be their shadow while they do you dream job and see from there if your heart still says yes to pursuing it. In general, the Wheel of Fortune is a good sign, especially if you are currently facing difficult times financially. This only means that brighter days are expected and that change is likely to come for the better. But if you have rather good financial stability at the moment, you may want to get ready for the possibility of loss. Be sure to always have a savings account for any“rainy days” to come. But in the end, after all, everything evens out. 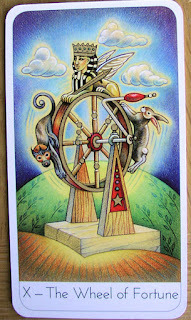 Change is something that you can always expect when faced with a Wheel of Fortune card in a reading. Whether you like it or not, it will come to you. So, do not consciously resist taking stock of the situation as that can allow bad things to happen, which you might otherwise have prevented. Take a moment in your day to meditate and practice breathing. Your stress levels should always be kept under control. It is your wake-up call to remember that, apart from your spirituality, your health is a priority. Start eating healthy foods again, get enough sleep at night, and go out to sweat out stress in exercise. It does not matter if you are into basketball, running, jogging, or badminton. What is important is that you are moving and that your body is in shape. Always drink sufficient water to keep yourself refreshed and hydrated. Do you have anything to add? I would love to hear from you. Leave a message below. This feature was written by Samantha Miles. The photographs show tarot cards from the Robin Wood deck, the Wisdom Seeker's Tarot and the Bacchus deck.